I used to hate the thought of “networking.” The very term sounded to me like something done on Wall Street in 1980’s large-shoulder-padded suits with false and manipulative undertones. Having been on both sides of the status structure for networking (as a BBC presenter, people WANT to know you, as an actress, lots of people DON’T) I found the whole premise to be, well, just icky. But then I found myself in a position where it would be stupid NOT to network. A short film I star in is getting a lot of attention around the country, and when it was accepted into the Hollyshorts festival in LA, I knew I had to go… to take a little vacation, catch up with some friends, and yes, network… Gross. But did I mention the film was screening at Graumman’s Chinese Theatre in Hollywood? How could I miss it?! But eeewwww I was going to have to network… !!! Well, I’m writing this blog on the plane ride home from a week in LA and can actually now say, “networking is fun!” What? Ew! Yes, I said it. How did my mindset change? Well, on the plane ride over to LA, I was imagining the upcoming networking scenarios with dread. But at the same time, I was chatting with some other people on the plane and thinking about how much I like meeting new people and hearing about their lives. And then it hit me… um, duh. That’s what networking can be! The key for me was to stop thinking it was a status play, a way for people to try to impress those who have something they want. If I could just look at networking as a chance to meet new people and hear about their lives, work, passions, etc, then it could actually be kind of fun. The result: I met lots of cool people! 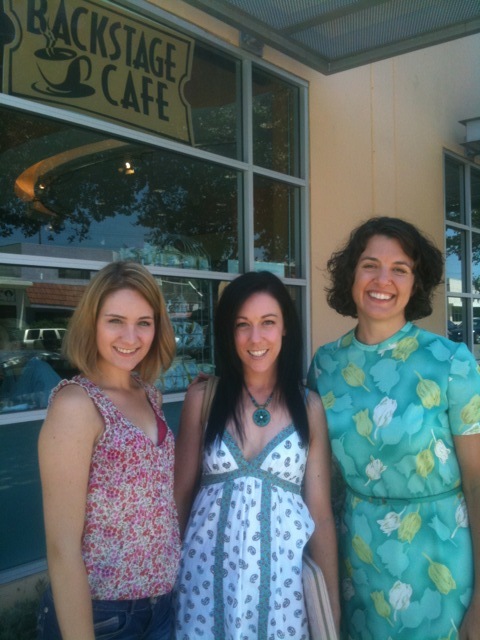 For example, when I let the West Coasters from The Green Room Blog know that I was in LA, The California Triple Threat suggested a great place where we could meet for coffee with The British Dancer and just have a chat. It was great. We don’t know each other at all except through the blog, but we had lots to talk about, regarding the similarities and differences in our career paths. It was great to hear about musical theatre in LA and their jobs and I told them a bit about life working on New York indie films. It was a nice talk and yes, I guess we “networked” but I never had the sense that anyone was manipulative or trying to get something from another person. It was just meeting new people. Networking with heart! Cool. Another big chance to test my new networking modus operandi came at a panel discussion at the film festival. Four emerging screenwriters and directors talked about their challenges, breakthroughs and inspirations. When it came time for the Q&A I trembled a bit. I had a question I wanted to ask, but as an actor, feared they would think that my question was a thinly veiled attempt at shoving my headshot and resume down their throat. But I repeated my mantra: “this is just me, meeting new people, and that’s cool.” The panelist seemed to appreciate my question and answered it with honesty and friendliness. Later, I connected with two of them on Facebook, just authentically thanking them for their time. They responded, and I realized my new take on networking was working! It’s not about trying to get something. It’s just about people meeting other people. Very simple and enjoyable, and frankly, sort of what life is about: making connections and growing through that. I can’t believe what a simple but profound mind shift this has been for me, and that I was so silly to not realize it before. I always loved “meeting new people,” but hated “networking.” Finally realizing that these concepts can be the same thing has been transformative for me. How do all of you network with heart? I’d love to hear your experiences. I had a lovely time meeting you and your boyfriend! and I agree, it didn’t feel at all like networking. 🙂 Glad you enjoyed your trip! See you on the east coast next, hopefully! Love this post, love that picture, love all of you!